Dream League Soccer 2016 lets you build your ultimate dream team by recruiting FIFPro™ licensed players and training youngsters. You can also build and upgrade your stadium besides creating your own team from scratch. The game also lets you choose your own tactics and formations. You will have complete control over your players on the field. It’s a fine combination of football management sim and soccer simulator. When your players are defending, pressing and holding button B makes a player put pressure on the ball, whereas holding button A makes him perform a slide tackle. Of these two, try using button B instead of button A if you want the ball in your possession. With a slide tackle, chances of tripping someone are more and for this your player may get a yellow card or a warning by the referee. By holding button B, your player just puts more pressure on his opponent and can easily have the ball without tripping him. When your opponent has the ball, move your controlled player towards him while pressing and holding the B button to put pressure on the ball. The game’s smart AI chooses the closest player, but you can tap button C to choose the player you want to control and move him towards rival team’s player. The in-game camera plays a key role in providing the best view of the field and somehow can help you manage and control your players better. Every gamer has his own camera choice. I was very comfortable controlling my players, passing and shooting in “Sideline” and “Goal to Goal” camera types. To change a camera type, Tap “My Profile” at the top-right corner of the screen and press “Game Settings”. Tap on the arrows to change the “Camera Type”. Choose an in-game camera that suits your play style and helps you control and manage players better. Just make sure you practice playing with the chosen camera style in “Training Mode” before playing the real game. Experiment with different camera angles and choose the one that provides a much better view and lets you control your players better. You may also want to adjust the camera distance. A 100 percent camera distance will zoom out whereas a 0 percent will zoom in to the field. Adjust the camera distance by setting it at 50 percent. However, if you want a more up close and personal view of your players, then you may set it to 0 percent. When your player has the ball and he is close to his goal, try not to press and hold the A button for a longer time. If you are pretty close to the penalty kick area, then just tap and hold till the meter fills up 15-20 percent. Many times I just tapped the A button to shoot if my player gets near the box. Pressing and holding the A button for a longer time will make the player shoot the ball way above the goal. Distance and angle matters and so use the A button carefully while moving your player using the virtual analog stick. Alternatively you can press the B button to make the player shoot with the inside of his foot. You can also try tapping the C button for a chip shot. Try experimenting with button B and C to score a goal in Training Mode first and once you are comfortable with the shooting part, begin playing league matches. You can heal your injured player or have other players in your team regain their health by spending coins. Healing an injured player requires more coins than healing someone with a lower health bar. To heal a player in Dream League Soccer 2016, go to Team Management and tap on a player card. A battery icon will appear at the bottom-right corner of the screen. Tap on it and the player will reach 100 percent health. Coins that you spend on each player’s health will depend on his health meter. Lower the health meter, more coins are required to heal him completely. In Team Management, you can also set player roles. Tap on the player card and a new “Roles” button appears at the bottom left corner of the screen. This is where you can set a player of your choice as your team’s captain or assign different roles such as Free Kick, Penalty Shootouts etc. Scan your team and choose that bets players to assign roles to them. You can choose a formation of your choice. Personally, I would go for 4-2-2 or 4-3-3, but then there’s no harm in experimenting with other formations and choosing the one that suits your play style. You can also experiment with different tactics, such as “Attacking”, “Moderate” and “Defensive”, which can be easily changed while playing. 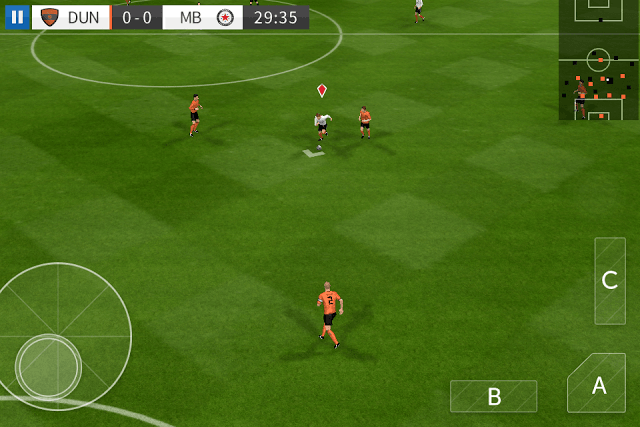 Formations and tactics are available in “Team Formation”. It will take some time to familiarize with the game’s control scheme and the best way to get acclimatized to it is to hit the Training mode. The practice mode not only provides free training to improve your shooting and passing skills, but also lets you practice free kicks, penalty shoot-outs and penalty saves. Tap on “My Club” > Training and then press the pause button at the bottom left corner of the screen. To switch to a different training mode, tap on the white arrow beside “Free Training”. There are six types of training modules available: Free Training, Free Kick, Left Corner, Right Corner, Penalty and Penalty Save. Practice each module and start playing league matches when you are fully confident about passing, shooting, penalty kicks and saves. Go to My Club and tap “Dream FC Stadium”. This is where you can upgrade stands and increase crowd capacity. Upgrading stands will grant you stadium bonus and you will receive more coins after the match is over. 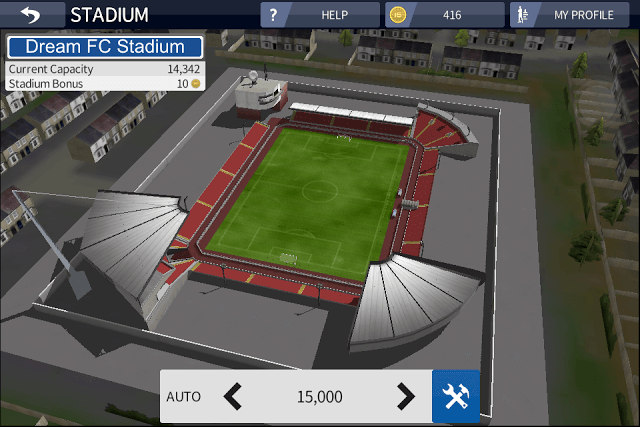 Stand upgrades require coins, so try to invest coins in stadium upgrades from the 1000 free coins given to you. Besides earning bonus coins from home matches, you earn coins for winning a match. Coins are also earned if there’s a clean sheet, i.e. no goal conceded by your team’s goalkeeper. You get extra coins for the number of goals scored by your players. You also receive coins for completing an achievement. To see a list of achievements, go to “My Profile” > Game Center. Hi! How do I do to view my achievements? Or how to unlock the achievements option? If you have installed the latest Dream League Soccer game (2019), then you can find the achievements section via “options”. Tap career, and then tap “options” on the upper left corner of the screen. Now tap “achievements” to view the list. My players keep on tackling on their own and this costs me big matches. I guess the game automatically switches between players and selects the one closest to your opponent. While playing, tap the pause button on the upper-left corner of the screen. Go to “Game Settings” and tap “Controls”. You can turn off “auto switch” or keep it low if you want to manually choose players to tackle. You will have to press “C” button to manually switch between players. Hello. I will certainly digg it and for my part recommend to my friends. I’m sure they’ll be benefited from this site.